In his latest book, "The Columbus Affair," Steve Berry introduces a suicidal investigative journalist on the trail of a 500-year-old mystery, one that could change forever what we think about Christopher Columbus. In "Low Pressure," Sandra Brown writes of the death of a young woman, at first believed to have been the casualty of a devastating tornado, but who was actually murdered by someone who, for 18 years, has gotten away with it. In "Red Rain," the just-published horror novel for adults by R. L. Stine, a young woman adopts twin boys who were victims of a devastating hurricane and brings them to her Long Island home -- with disastrous and horrifying results. It's these kinds of stories -- tales that these three major figures of American fiction weave with skill and grace and flashes of humor -- that keep their dozens of books in print and their readers enthralled and eagerly awaiting the next novel. And all three have drawn strength from one of the giants of American literature: Mark Twain. In an event that unites three perennial New York Times bestselling authors, following on the heels of the museum's powerful Mark My Words event in New Haven last year, The Mark Twain House & Museum will present Mark My Words: An Evening with Steve Berry, Sandra Brown and R.L. Stine on Thursday, Oct. 11, at 7:30 p.m. at the Simsbury High School Auditorium, 34 Farms Village Road. In a wide-ranging conversation moderated by Jan-Patrick Schmitz, the erudite and witty CEO of Montblanc North America, the fine writing instrument designer and manufacturer, the three will tell of their writing lives and convey the influence Twain had upon their work. Mark Twain House & Museum Interim Executive Director Patti Philippon states: "We are thrilled to bring an evening of conversation on writing from some of America's most popular authors, before an audience for a second year. The proud and literate Farmington Valley community of Simsbury is the perfect site for such an occasion. I look forward to joining these amazing authors for an unforgettable night for book-lovers." To make this event affordable to all these authors' many fans, tickets for this major event are moderately priced at $45 and $65. A $125 ticket includes premium seating in the first six rows and VIP pre-event reception with the authors at 5:30 pm. at Hop Meadow Country Club. All proceeds support the programs of The Mark Twain House & Museum. Tickets can be obtained at www.twainmarkmywords.com or by calling 800-838-3006. Additional information is available at www.twainmarkmywords.com. This informational website has been created by East Hartford's ForeSite Technologies, and includes event news and information about the authors, venue, parking, directions, and more. Steve Berry is the New York Times bestselling author of the Cotton Malone series featuring The Jefferson Key, The Emperor's Tomb, The Paris Vendetta, The Charlemagne Pursuit, The Venetian Betrayal, The Alexandria Link, and The Templar Legacy. His latest is The Columbus Affair, one of four stand-alone thrillers that include The Third Secret, The Romanov Prophecy, and The Amber Room. He also has three e-book original short stories: The Balkan Escape, The Devil's Gold, and The Admiral's Mark. Berry has 14 million books in print, which have been translated into 40 languages and are sold in 51 countries. Berry is also an accomplished instructor, having taught writing to audiences across the globe. He and his wife, Elizabeth, have a foundation, History Matters, dedicated to aiding the preservation of our heritage. They have crossed the country doing fundraising receptions and workshops for preservation leagues, historical societies, museums, libraries, and educational institutions to raise vital funds for historic preservation. This work was recognized in April by the American Library Association, which named Berry its first spokesman for National Preservation Week. Learn more at www.steveberry.org . Sandra Brown is the author of sixty-one New York Times bestsellers, including Rainwater, Tough Customer, Smash Cut, Smoke Screen, Play Dirty, Ricochet, Chill Factor, White Hot, Hello, Darkness, The Crush, Envy, The Switch, The Alibi, Unspeakable and Fat Tuesday, all of which have jumped onto the Times bestseller list in the number one to five spot. She is much in demand as a speaker and guest television hostess. Her episode on truTV's Murder by the Book premiered the series in 2008, and in 2010 she was one of the launch authors for Investigation Discovery's new series, Hardcover Mysteries. In 2009 Brown detoured from her thrillers to write Rainwater, a much-acclaimed, powerfully moving story about honor and sacrifice during the Great Depression. R. .L. Stine says he has a great job: "to give kids the creeps." His books are read all over the world. So far, he has sold over 350 million books, making him one of the best-selling children's authors in history. After graduating from Ohio State University in 1965, Stine headed to New York City to become a writer. He married Jane Waldhorn in 1969. Many of his books are published by her company, Parachute Press. In 1986, Stine turned scary with his first teen horror novel, Blind Date, which became an instant best-seller. Many scary novels followed, including Beach House, Hit And Run, The Babysitter, and The Girlfriend. In 1989 he created the Fear Street series, the best-selling young adult book series in history. 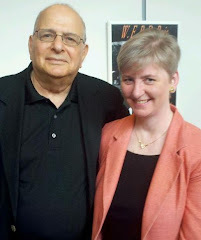 He wrote nearly 100 Fear Street books about teens facing all kinds of terror. The Goosebumps initial series began in 1992. The book series quickly became a hit around the world. Translated into 32 different languages, it made Stine a worldwide publishing celebrity. Red Rain is Stine's first adult hardcover novel in ten years. Published by Touchstone Books, the horrifying story is designed to appeal to the millions of former Goosebumps and Fear Street readers who crave more terror from their favorite author. Jan-Patrick Schmitz was named President and Chief Executive Officer of Montblanc North America in August 2003. He oversees the North American business, including sales and marketing, a retail network of 34 boutiques, and a wholesale distribution of 500 points of sale. A charismatic individual with a sixth sense for innovation, he has partnered with Urban Arts partnership to flourish projects such as "The 24-Hour Plays" on Broadway and Los Angeles, as well as partnering with and supporting The Juilliard School with their numerous events and programs. The Eugene O’Neill Theater Center will begin accepting scripts for the 2013 National Playwrights Conference on Monday, Sept. 17, 2012. Applicants for the National Playwrights Conference may submit works to the O’Neill’s Open Submissions Process through Wednesday, Oct. 24, 2012. The National Playwrights Conference, led by Artistic Director Wendy C. Goldberg, supports playwrights during the creation and development of new play projects. The authors of the selected works will be awarded a residency for the entire month of July 2013, including an intensive rehearsal process and two staged, script-in-hand public readings. A stipend, housing, meals, and transportation are provided for each writer selected for this month-long residency. Plays of any length or genre are eligible; however, to be included in the conference, the work must remain unproduced through July 31, 2013. Early submissions are strongly encouraged. No agent is required. The submission fee is $35 dollars and covers the costs of the process. In an effort to reduce the overall cost of applying, NPC will continue to accept electronic submissions this year. Visit http://www.theoneill.org/summer-conferences/npc/submission-info/ for more information about the submission process and to sign up to receive updates. Please direct any questions about the conference to Anne G. Morgan, Literary Manager at (860) 443-5378 ext. 227 or email litoffice@theoneill.org. The Bushnell will celebrate the imminent arrival of everyone’s favorite magical nanny, Mary Poppins, with a free family Block Party on Saturday, Sept. 8 from 11 am to 3 pm. 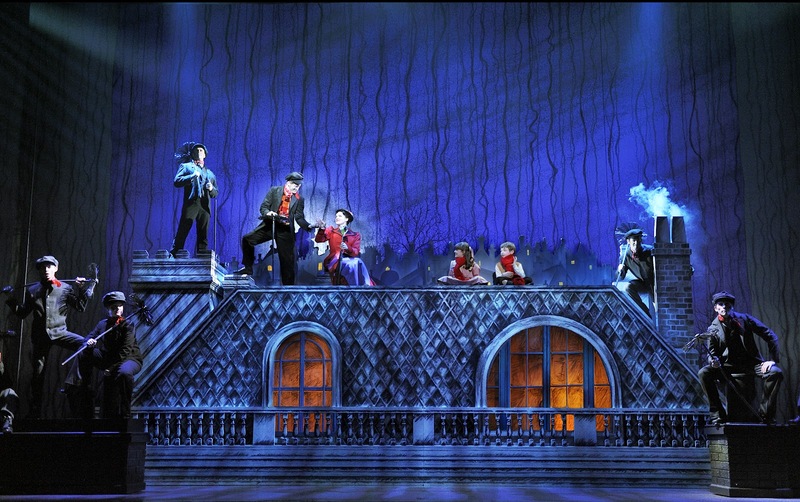 The event precedes The Bushnell’s Sept. 14 – 23 engagement of Mary Poppins. Using a free kite kit provided by The Bushnell, kids can assemble & decorate their own flying creations. Weather permitting they can stroll down to Bushnell Park and “send them soaring!” Also, the first 100 families to arrive will receive a freeMary Poppins logo kite. From the Great Hall balcony, Ensign-Darling Vocal Fellows will give free recitals of Disney music. Kids of all ages can gather in the courtyard, learn a little choreography, and then dance along to a famous Mary Poppins song. Professional chalk muralist Tracy Lee Stum will create a spectacular 3D mural at the entrance to the Bushnell courtyard. The mural will depict famous Broadway characters - including Mary Poppins - enjoying Bushnell Park as it might look like in years to come, thanks to the iQuilt Plan (www.theiQuiltPlan.org). Kids and parents alike will then be able to step into the mural and take pictures in the Bushnell Park of tomorrow. Families will have an opportunity to sketch their own chalk drawings on the Capitol Avenue sidewalk in front of The Bushnell. Sing-Along Film Screening – Families can gather in The Bushnell’s Belding Theatre and sing along to a free screening of the film version of Mary Poppins – complete with on-screen lyrics. Tickets are required, and are free! Bushnell Park Carousel and Memorial Arch will open for business and tours. Food carts will set up along Capitol Avenue for the purchase of refreshments. Café tables & chairs will be available on the veranda outside the box office. All Block Party activities are free and open to the public on a first-come, first-served basis. Tickets for the show are on sale now and can be purchased online at www.bushnell.org or by calling The Bushnell box office at 860-987-5900. 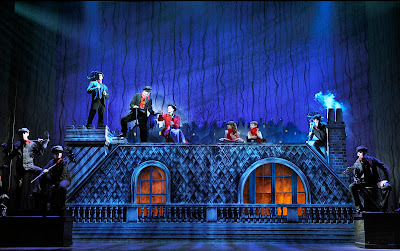 "Disney and Cameron Mackintosh present Mary Poppins" kicks off the 2012-2013 Broadway Series season, sponsored by Travelers and Webster Bank. Tickets for the Waterbury Palace Theater’s 2012-2013 season presentations of “People’s Tenor” Michael Amante, legendary singer/songwriter Paul Anka’sChristmas My Way tour, and the multi-media stage experience “This Is The '60s” go on sale Thursday, August 30, at 10 a.m.
Tickets can be purchased by phone at 203-346-2000, online at www.palacetheaterct.org or in person at the Box Office,100 East Main St., Waterbury. Summer Box Office hours are Monday through Thursday, 10 a.m. – 3p.m. The Box Office will be closed Friday through Sunday until September 17, when it returns to its regular hours of operation. Tickets can be purchased online 24 hours a day at www.palacetheaterct.org. Affectionately known as the “People’s Tenor,” internationally-acclaimed vocalist Michael Amante, accompanied by Waterbury’s own soprano Marissa Famiglietti and a 22-piece orchestra, will perform showstoppers from both Broadway and the Opera. 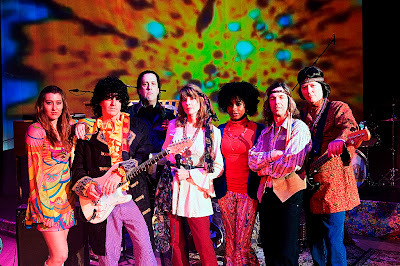 This ultimate multimedia stage experience uses a creative blend of live music, film, dance, vintage fashion, and computer-generated imagery to explore the events that shaped the music, and the music that helped shape the events, of one of the world’s most turbulent decades. Just in time for the holidays, legendary singer/ songwriter Paul Anka performs timeless renditions of everyone’s favorite holiday classics, in addition to his signature songs, "Puppy Love," "Put Your Head On My Shoulder," "My Way" and more. Simsbury will host the world premiere of a new documentary film on the life of town native Gifford Pinchot that was produced by the Public Broadcasting System (PBS). The event on Sept. 6 will be held at The Riverview, 10 Winslow Place, and will include a gala dinner and presentation by Tom Tidwell, Chief of the US Forest Service. Event proceeds will benefit several Simsbury community organizations, including the Simsbury Free Library, Simsbury Land Trust, Simsbury Main Street Partnership and the Pinchot Sycamore Preservation Fund. 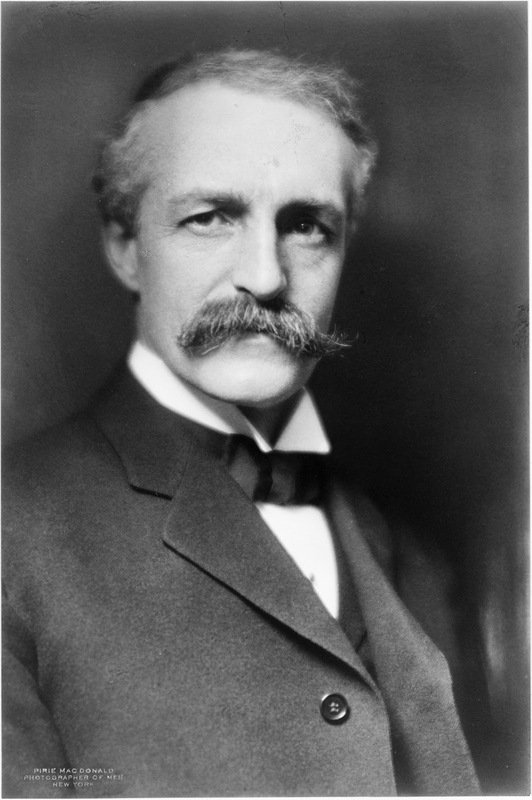 Simsbury is the birthplace of Gifford Pinchot (1865 – 1946), one of America’s pioneers in the conservation of natural resources. 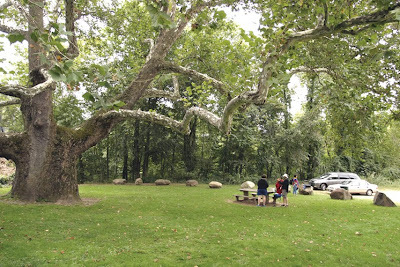 The Pinchot Sycamore, named in his honor on the 100th anniversary of his birth in 1965, also stands in Simsbury. It remains the largest living tree in Connecticut and is estimated to be between two and three centuries old. Gifford Pinchot is recognized for reforming the development and management of forests in the United States by advocating for the conservation of land reserves through planned use and renewal. He called it "the art of producing from the forest whatever it can yield for the service of man." Pinchot served as the first Chief of the U.S. Forest Service from 1905 to 1910. He was also the 28th Governor of Pennsylvania, serving from 1923 to 1927 and again from 1931 to 1935. The new documentary film, titled "Seeking the Greatest Good: The Conservation Legacy of Gifford Pinchot," highlights Pinchot’s philosophy of natural resource conservation through sustainable use. Nearly 50 years after its founding, the Pinchot Institute for Conservation continues the work of its namesake and is an international leader in the conservation community for environmental education and studies in natural resource policy. Working in partnership with the U.S. Forest Service, the Institute is located at Grey Towers National Historic Site in Milford, PA.
For ticket reservations and information, please emailsimmainst@sbcglobal.net , call 860-651-8577 or visitwww.shopsimsbury.com/pinchot. and Institute for Curatorial Practice in Performance (ICPP) present art exhibition debut: "Performance Now" Friday, Sept. 7 through Sunday, Dec. 9 in the Ezra and Cecile Zilkha Gallery, Tuesday - Sunday from noon to 5 pm. Opening Reception: Tuesday, Sept. 11, 5 to 7 pm; Gallery Talk by curator RoseLee Goldberg: 5:30 pm. “Performance Now” is a selection of works by 19 artists froma vast repository of new performance from around the world since 2000, a periodthat has witnessed an exponential growth in the field. More than a centuryafter the Italian Futurists insisted on an increased engagement with their audiencesand solicited artists of every discipline to join their cause, performance byvisual artists has become central to our understanding of the development ofcontemporary art ideas and sensibilities. Bringing together some of the most significant practitionerstoday, “Performance Now” surveys critical and experimental currents inperformance internationally featuring works by Marina Abramović, WilliamKentridge, Clifford Owens, Spartacus Chetwynd and Jerome Bel, amongothers. Exploringthe ephemerality of live performance and how this is captured by artists andtransformed into new work that contains the power and content of the original,together the selected works are an indication of the extent to which visualartists use performance as part of their creative process; how that processproduces objects, installations, video, or photography interchangeably; and howthese mediums have been enlivened by the demands of recording performance ininnovative ways. With performance art departments recently being establishedin many major museums throughout the world and performance recognized as one ofthe most significant artistic forms of the 21st century, thisexhibition provides a window onto these important developments. “PerformanceNow” is a series of ongoingexhibitions designed to introduce some of the most exciting projects ofperformance from 2000 to the present and to generate discussion about thehistory of performance art. The material is selected from a publication of thesame name, “Performance Now,” by RoseLee Goldberg, which will be published byThames and Hudson in 2014. The debut of the exhibition at Wesleyancoincides with the University’s new Institutefor Curatorial Practice in Performance (ICPP), a post-graduate certificateprogram that is the first of its kind in the United States. “ICPP brings artists, presenters, managersand other arts professionals together with Wesleyan faculty and some of thefinest performance curators working today. Our students develop a responsive curatorial practice that takes thebest from the fields of visual and performing arts. We knew that “PerformanceNow” would be an important show to integrate into this year’s ICPP curriculum,while also resonating with community members and many of our undergraduate andgraduate arts students interested in exploring contemporary performancepractices and their social and historical contexts,” said Pamela Tatge,Director of Wesleyan’s Center for the Arts and Managing Director of ICPP. At Wesleyan, the exhibition alsoextends to a film series, selected by Performa film curator Lana Wilson, a 2005 graduate of theUniversity (see below for film series details). Other Wesleyan alumni workingin performance art, including Liz MagicLaser ’03 (one of the artists featured in the “Performance Now” exhibit), Aki Sasamoto ’04, Arturo Vidich ’03, and DanielleMysliwiec ’98, will be panelists at a free seminar moderated by Greta Hartenstein ’11 in the Ezra and Cecile Zilkha Galleryduring the University’s Homecoming/Family Weekend on Saturday, October 20, 2012at 2pm. Ms. Goldberg’s seminal study, “Performance Art: From Futurism to thePresent” (first published in 1979 and now in its third edition) is regarded asthe leading text for understanding the development of the genre and has beentranslated into more languages (including Chinese, Croatian, French, Japanese,Korean, Portuguese, and Spanish) than any other book of its kind. When directorof the Royal College of Art (RCA) Gallery in London, Ms. Goldberg established aprogram that pioneered an integrative approach to curating exhibitions,performance, and symposia, directly involving the various departments of theRCA in all aspects of the exhibitions program. As curator at the Kitchen in NewYork she continued to advocate for multi-disciplinary practices to have equalprominence by establishing the exhibition space, a video viewing room, and aperformance series. Most recently, her vision in the creation of Performa hasset a precedent for performance art that is now impacting museum programmingand diverse audiences across the U.S. and abroad. A delightful, beautifully shot exploration of the possibilities for fragmentingdance through editing, from bar to boathouse and back again. A ballet dancerappears alone on stage at the Paris Opera House, narrating her life’s historyas a dancer in what will be the final performance of her career. Commissioned byPerforma to create his first performance for the Performa 05 biennial, Danishartist Jesper Just used three-dimensional technology to create “True Love isYet to Come” (2005), an opera exploring the subject of love through anintriguing all-male cast whose emotional nakedness is underscored by pop musicand a noir sensibility. This program will showcase the documentation of theperformance of “True Love” alongside Mr. Just's “No Man is an Island” (2002)and “Bliss and Heaven” (2004). This program pairs films made by two artists who breakdown the boundaries between dance, visual art, and music, in work that shares ahighly aestheticized exterior belying more complex and disturbing content. 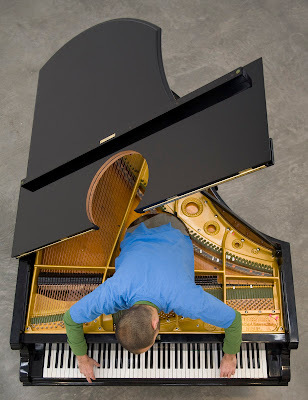 Theelegant work of British artist DariaMartin—“In the Palace” (2000), “Loneliness and the Modern Pentathlon”(2004-5), and “Harpstrings & Lava”(2007)—presents the human body as a mechanized and abstract containerfor rich emotions, composed with the eye of a painter for two-dimensionalsurfaces and the mind of a filmmaker for visceral three-dimensionalperspectives. Laurie Simmons,best known for her large-scale puppet-based photographs from the 1980s, madeher directorial debut with “The Musicof Regret” (2006), a three-act musical that uses puppets to enact talesof ambition, disappointment, love, loss, and regret, suggesting the darker sideof domesticity, and the fragile ecology of everyday life. Total running time 78minutes. “Performance Now” is produced by Independent CuratorsInternational (ICI), New York, and Performa, New York. The curator for theexhibition is RoseLee Goldberg, Artistic Director and founder of Performa. Theexhibition and tour are made possible, in part, by grants from the Horace W.Goldsmith Foundation, and the Andy Warhol Foundation for the Visual Arts; theICI Board of Trustees; and donors to ICI's Access Fund. At Wesleyan University, “Performance Now” is co-sponsored by the Center for theArts, the Department of Art and Art History, and the Institute for CuratorialPractice in Performance. The“Performance Now” Film Series is co-sponsored by Wesleyan University's Centerfor Film Studies. Founded by RoseLee Goldberg in2004, Performa is the leading organization dedicated to exploring the criticalrole of live performance in the history of 20th century art and to encouragingnew directions in performance for the 21st century. Performa launched NewYork’s first performance biennial, Performa 05, in 2005, followed by Performa07 (2007), Performa 09 (2009), and recently, Performa 11 (2011). Independent Curators International (ICI) connects emerging andestablished curators, artists, and institutions to forge international networksand generate new forms of collaboration through the production of exhibitions,events, publications, and curatorial training. Headquartered in New York, theorganization provides public access to the people and practices that are key tocurrent developments in curating and exhibition-making around the world,inspiring fresh ways of seeing and contextualizing contemporary art. Since itwas established in 1975, ICI has worked with over 1,000 curators and 3,700artists from 47 countries worldwide. Since 2010, 15 ICI exhibitions have beenpresented by 70 venues in 23 countries profiling the work of over 370 artistsworldwide; 110 curators and artists from the U.S and abroad have contributed toICI’s talks programs, online journal, and conferences; and 121 curators from 24countries and 14 U.S. states have participated in the Curatorial Intensives,ICI’s short-course professional training programs. Wesleyan University’s Center for the Arts isan eleven-building complex on the Wesleyan campus that houses the departmentsof Art and Art History, Dance, Film Studies, Music, and Theater. Opened in1973, the CFA serves as a cultural center for the region, the state andNew England. The Center includes the 400-seat Theater, the 260-seat Hall, theWorld Music Hall (a non-Western performance space), the 414-seat CrowellConcert Hall and the Ezra and Cecile Zilkha Gallery. The Center for the Arts gratefullyacknowledges the support of its many generous funders and collaborators,including the Doris Duke Charitable Foundation, The Andrew W. MellonFoundation, the National Endowment for the Arts, and the New England Foundationfor the Arts, as well as media sponsors the Hartford and New HavenAdvocates, Shore Publishing, WESU 88.1FM, and WNPR. The Institute for Curatorial Practice in Performance was founded in 2010by Wesleyan graduates Samuel A. Miller and Pamela Tatge, Director of the Centerfor the Arts, in partnership with New York’s Danspace Project, in response tothe co-existence and cross-pollination of idea- and technique-based performancepractice. The Certificate Program considers performance in its broadest senseand the curriculum addresses time-based art practices of artists, curators andcultural leaders working in dance, performance art, experimental theaterand traditional/culturally specific programs and various combinations ofthese and other disciplines. The ICPP’s curriculum is designed to deepenthe professional student’s knowledge of diverse curatorial practices andimprove critical thinking and writing skills. ICPP students are required totake six courses in Artistic and Curatorial Practice, Social and CulturalContext, Entrepreneurial Strategies, and a Final Independent Project overseenby an advisor from the program or another field professional. Currentlythere is no post-graduate program in the United States that addressescuratorial practice in performance. The Institute for Curatorial Practice inPerformance fills this gap, as an interest in contemporary performancecontinues to thrive. The ICPP is committed to training arts professionals whowill build on the momentum of contemporary performance by using new informationand resources as creatively as possible, while also understanding howhistorical practices have shaped where we are today. This is 2 hour show performed without an intermission. Doors will open 30 minutes prior to show time. The Downtown Cabaret Theatre is located at 263 Golden Hill Street in Bridgeport, Connecticut. This appearance kicks off Gary's book tour. There will be a meet and greet and book signing following the performance. This is 1 hour show performed without an intermission. Doors will open 30 minutes prior to show time. Siobhan Magnus is the only former “American Idol” finalist (sixth place on season 9) to independently write, record and release an album of original songs, ten in all, along with one select cover track. Siobhan formed her own Massachusetts corporation in order to publish and record her songs on her own record label, “Snotface Records,” truly independent! *This is a 90 minute show performed without an intermission. Doors open 30 minutes prior to show time. TOM SADGE as Neil Diamond returns to the Downtown Cabaret Theatre By Popular Demand! You’ll think you’re seeing the real thing! Having spent time with the star himself, Tom Sadge brings the true essence of Neil to life on stage! This is a 75 minute show performed without an intermission. Doors open 30 minutes prior to the show time. Ted Vigil has been performing his John Denver Tribute since 2006. He has played all over the United States and even performed with the Nashville Navy! Ted has been featured on Northwest Afternoon, Evening Magazine, Headline Country and Country Weekly. His gift for music and his polished and energetic performing style have earned him many dedicated fans. Steve Weisberg, John Denver’s lead guitar player during all of his big touring years will be accompanying Ted. *This is a 75 minute show performed without an intermission. Doors will open 30 minutes prior to show time. If you loved Frankie Valli and the Four Seasons, Tommy James and the Shondells, Carly Simon, Cat Stevens, Elton John and Jim Croce….the Downtown Cabaret is the place to see The Hit Men, one great show featuring 6 Original Performing and Recording Members from these great mega star acts from the 60s, 70s and 80s…performing all of your favorite songs, from “Oh What a Night,” “Who Loves You,” and “Sherry,” to “Peace Train,” “Crocodile Rock,” “Leroy Brown” and “Mony Mony” plus lots of others. You’ll know every word of every song in this night of mega hits. The cast of “ABBAMANIA,” rated the number one Abba production in the world, is from Toronto Ontario, Canada. With incredible vocals plus authentic costumes, re-created by the seamstress from MAMA MIA, ABBAMANIA will take you back in time to when ABBA was on stage, live in concert. The concert features 22 songs from the ABBA canon in a two-set show with costume changes, choreography, comedy and a great concert sound. Nobody rings in the New Year the way the Downtown Cabaret Theatre does! The evening gets underway with the 8:30pm performance of ABBAMAINIA. After the performance, D.J. Jimmy Cabaret continues with the music of the 70′s plus all your favorite music with a big nod to DISCO. Disco attire is optional! Admission includes the performance, the after-performance party, party favors, ice and soda, coffee and danish and a 21 confetti cannon salute to the new year at midnight. New Year’s Eve always sells out…so get your tickets now! The Palace Theater has announced the receipt of an American Savings Foundation grant of $27,000 to support the after-school character developmentprogram “Finding, Defining and Realizing Your Dream.” Based on the TonyAward-winning musical Dreamgirls, the month-long program explores the historical context and social themes presented in the musical to provide high school students with a performing and language arts integrated experience that increases art appreciation while cultivating a youth voice regarding social issues. Students will participate in series workshops during which they will study the Civil Rights movement, create visual art projects, write original short stories and poetry, as well as develop a social awareness project based on the musical’s themes, including discrimination, racial and gender biases, social pressures and classism. Students will also receive complimentary tickets to attend the theater’s May 31, 2013 presentation of the Dreamgirls National Broadway Tour,as well as meet the cast in a question and answer session. Schools and students from the Greater Waterbury area interested in participating in this program, which begins in April 2013, are encouraged to contact Educational Programs Manager Dawn Alger at 203-346-2002. The Bijou Theater, 275 Fairfield Ave., Bridgeport, offers a full slate of movies. Visit http://thebijoutheatre.com for a full schedule. Howard Fishman is on tap Sept. 19. Hartford Stage will hold Young Company auditions for A Christmas Carol on Thursday, Sept. 6 and Friday, Sept. 7 from 3 to 6 pm. Young Company callbacks will be on Monday, Sept. 10 from 3 to 6 pm. Auditions will be held by Associate Artistic Director Max Williams. Actors should be between the ages of 5 and 13 and may not be a member of the Actors Equity Association. No one turning 13 years of age on or before Dec. 30, 2012,will be eligible for the audition. Rehearsal and performance dates are Nov. 9 through Dec. 30. Young Company Actors should prepare a short monologue, speech or poem, and a short song to sing. (The Pledge of Allegiance, Happy Birthday, a lullaby, etc. are acceptable for younger children.) Actors should also bring a current photo and, if applicable, a resume or CV. Appointments for auditions can be arranged by emailing artistic@hartfordstage.org or calling 860-520-7103 weekdays through Friday, Aug. 31, between 9:30 am. and 5:30 pm. Audition location and requirements will be discussed when actors call to arrange for an appointment. Please visit www.hartfordstage.org for additional information. Hartford Stage also has announced six new and two returning members to the Board of Directors. Joining the Board for an initial two year term are Lois Anderson of Avon, Sonya D. Dockett of Avon, Judith E. Meyers of North Haven, Eric D. Ort of Farmington, Charlie Ortiz of Hartford, Esther A. Pryor of West Hartford, Judith E. Thompson of West Hartford, and John H. P. Wheat of Bloomfield. Fairfield University announces the appointment of Michael Horyczun as its new Director of Media Relations. Mr. Horyczun will oversee the management of the staff and the Office of Media Relations with special portfolio assignments in the placement of Fairfield University faculty experts, and publicity for student affairs, admissions, advancement, and the arts, including events at the Quick Center for the Arts, and exhibitions and programs at the Bellarmine Museum of Art and the Thomas J. Walsh Art Gallery. Mr. Horyczun is an accomplished journalist and public relations professional with over 20 years experience in both fields. Most recently, he served as Director of Public Relations for the Bruce Museum in Greenwich, CT, overseeing media campaigns that helped raise the profile of the institution, leading to record attendance. He also worked as the PR Director for Stamford Center for the Arts and was a marketing associate at the Westport Country Playhouse. 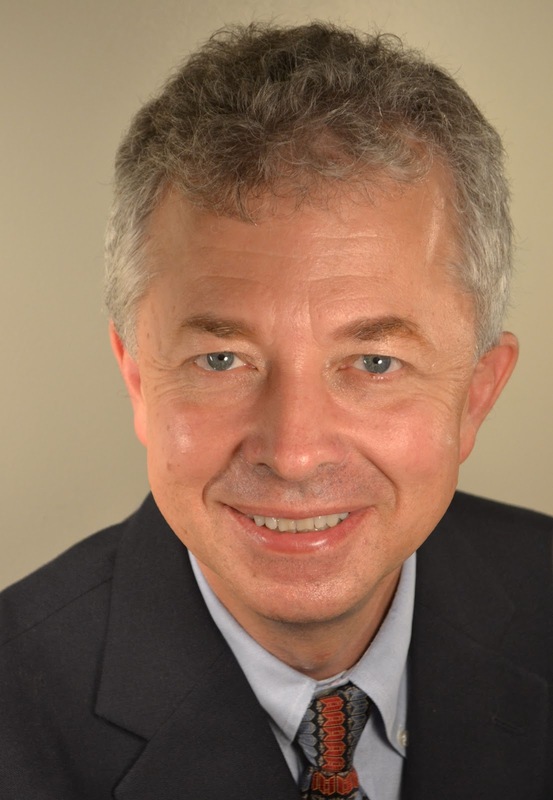 In addition to his public relations career, Mr. Horyczun has extensive journalism experience: as a feature writer and columnist for The Advocate/Greenwich Time and Westport News, and as a writer for the Norwalk Hour, contributing free-lance music columns. In addition to the print media, he has worked in the radio industry. He currently is an on-staff member at public radio station WPKN-FM in Bridgeport, CT, hosting a bi-monthly music program. He previously hosted a daily drive-time music program on WFUV in New York. A resident of Trumbull, CT, Mr. Horyczun is a graduate of the University of Connecticut, where he majored in English and Journalism. People with Parkinson’s disease are invited to explore how music and movement can be empowered into an exhilarating experience in a special day-long program taking place on Sunday, Sept. 9 at Fairfield University’s Regina A. Quick Center for the Arts. The Mark Morris Dance Group and Quick Center for the Arts, in association with the Connecticut Parkinson’s Working Group, the Parkinson’s Young On Set Support Group of Connecticut, and the Brooklyn Parkinson Group, are presenting this day-long workshop designed especially for people with Parkinson’s disease and their care partners. Students attending Fairfield University’s School of Nursing will also be in attendance. The event features Dance for PD® classes at 11 am and 2 pm and a lecture at 1 pm on the intersection of dance and Parkinson’s disease by Dr. J. Antonelle de Marcaida, of Eastern Connecticut Neurology Specialists. All events are free and take place at Fairfield University’s Quick Center for the Arts. The Dance for PD® classes, which are free of charge and feature live musical accompaniment, are the first to be offered in Fairfield County. Registration is available at www.danceforpd.org, or by calling 646-450-3373. On Wednesday, Sept. 19, author Philip McFarland speaks on "Mark Twain and the Colonel" -- the relationship between Twain and the first President Roosevelt. Twain called Roosevelt ""by far the worst President we have ever had." Roosevelt once said he would like to see Twain skinned alive. But the two men espoused some of the same populist causes and once dined together in the White House. McFarland is the author of the recently released Mark Twain and the Colonel: Samuel L. Clemens, Theodore Roosevelt, and the Arrival of a New Century (Rowman & Littlefield). McFarland's magnificent opus -- really a dual biography of the two men and their era -- has won praise from noted Twain biographers Justin Kaplan and Jerome Loving. The Trouble Begins at 5:30 is free, and is held on four Wednesday nights during the fall. While the lectures begin at 5:30. audiences like to gather for the reception beforehand at 5:00, which includes hors d'oeuvres, wine and coffee. www.marktwainhouse.org. The exhibit "Hartford Then & Now: Images of the City from Mark Twain's Era and Today," presented by Visions: A Gallery Without Walls, opens with a reception in The Mark Twain House & Museum Visitors' Center on Sunday, September 9, from 2:00 to 4:00 p.m.
Five local artists have created images of Hartford drawing inspiration from the Gilded Age, when Mark Twain and his family lived at Nook Farm, as well as more familiar contemporary features and iconic landmarks. The exhibition includes over 40 original pastel and acrylic paintings and fine art photographs and prints that reflect each artist's distinctive style and interpretation of Connecticut's capital city. The works on view at The Mark Twain House & Museum portray not only detail of the Mark Twain House itself, but also Hartford's skyline, the Connecticut River, the Rose Garden in Elizabeth Park, the Butler-McCook House, Corning Fountain in Bushnell Park, and several nostalgic still-life images and replicas of commercial signs. The artists featured in the show joined together several years ago to form Visions: A Gallery Without Walls. Rozanne Hauser and Lou Mazzotta of Bloomfield, Jo McGinnis of West Hartford and Flora Parisky and Sandy Parisky of Hartford are members of the Visions group. All work in the exhibit by Visions artists is available for purchase with a portion going to benefit The Mark Twain House & Museum. There is no charge for Sept. 9 opening reception. The exhibit may be viewed through Tuesday, Oct. 9, included in the admission price of a tour of the Mark Twain House or with a special $5 museum-only admission. The Mark Twain House & Museum has restored the author's Hartford, Connecticut, home, where the author and his family lived from 1874 to 1891. The free Nook Farm Book Talks at Hartford's Harriet Beecher Stowe Center continue with a discussion of "The Help" by Kathryn Stockett on Thursday, September 13 from 5 to 6:30 pm. The book is available for purchase in the Stowe Visitor Center. Stockett's novel portrays sharply defined black and white characters in the nascent years of the civil rights movement. Three very different, extraordinary women in Mississippi build an unlikely friendship around a secret writing project that breaks societal rules and puts them all at risk. 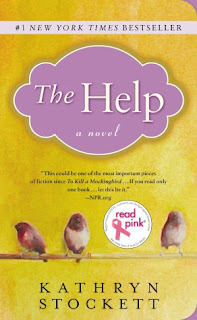 An immensely popular book, The Help was made into a major motion picture nominated for an Academy Award in 2012. Is Stockett's book a skillful depiction of the ironies and hypocrisies that defined an era? Or is it a white-washed version of the civil rights movement that praises a white woman as the savior of poor African Americans? Join us for what promises to be a lively discussion led by Stowe Center historic interpreter Sarah Rice. Refreshments will be served at 5:00 p.m. in the Stowe Visitor Center followed by a one-hour discussion beginning at 5:30 p.m. Registration is suggested: Call (860) 522-9258 ext. 317 or e-mail Info@StoweCenter.org. Free, secure parking is available at the Stowe Center (77 Forest St.) and The Mark Twain House & Museum (351 Farmington Avenue) parking lots. Nook Farm Book Talks is a collaboration between the Stowe Center and The Mark Twain House & Museum, made possible in part by the Connecticut Humanities Council. Nook Farm Book Talks continue September 20 with a discussion of A Guide to Historic Hartford by Daniel Sterner at the Harriet Beecher Stowe Center. For more information, call 860-522-9258, ext. 317. Connecticut residents have a unique opportunity to see two plays examining America’s complex issues with race, produced by Long Wharf Theatre and Westport Country Playhouse, while paying one low price. Long Wharf Theatre and Westport Country Playhouse are offering an $80 ticket package for their respective productions: the 1959 classic A Raisin in the Sunby Lorraine Hansberry and the 2012 Tony Award-winner it inspired, Clybourne Park by Bruce Norris. For $80, patrons will be able to purchase a package of tickets to selected performances of both plays. The package can be purchased from either theater. The special offer is available through Friday, September 7. Phylicia Rashad will direct the powerful classic A Raisin in the Sunby Lorraine Hansberry at Westport Country Playhouse this fall. The Tony Award-nominated play tells the story of the Youngers, a black family in 1950s Southside Chicago, and their quest for a piece of the American Dream. A towering drama, a play of passionate intensity and raw emotion, with complex characters who work their way into the hearts and minds of an audience, A Raisin in the Sun is a genuine 20thcentury American masterpiece. Long Wharf Theatre’s spring 2013 production of Clybourne Park, by Bruce Norris and directed by Associate Artistic Director Eric Ting, takes up where A Raisin in the Sun leaves off. Race and real estate collide in this outrageously funny and provocative Pulitzer Prize-winning new play. The action begins in 1959 in a small suburb of Chicago when a nervous group of neighbors are trying to talk their friends out of selling their home to a black family. Fast forward to the same house 50 years later when sparks fly as a white family attempts to move into the now predominantly African-American neighborhood. Long Wharf Theatre Artistic Director Gordon Edelstein believes that Clybourne Park is one of the most important plays on race penned in the last decade. Westport Country Playhouse’s A Raisin in the Sun performances eligible for the offer include: Tues., Oct. 9 through Friday, Oct. 12, at 8 p.m.; Tues., Oct. 16, at 8 p.m.; and Wed., Oct. 17, at 2 p.m.
Long Wharf Theatre’s Clybourne Parkperformances eligible for the offer include: Wed., May 8, at 7 p.m.; Thurs., May 9 through Sat., May 11, at 8 p.m.; Sun., May 12, at 7 p.m.; and Tues., May 14, at 7 p.m. The special offer is subject to availability; cannot be combined with any other special offer or discount; not applicable on previously purchased tickets at either theater; best available seating at both theaters; phone sales and walk-up only; and no refunds, no exchanges. For more information or tickets, Long Wharf Theatre’s box office at 203-787-4282, or visit 222 Sargent Drive, New Haven, CT. www.longwharf.org, or contact the Westport Country Playhouse box office at (203) 227-4177, or toll-free at 1-888-927-7529, or visit Westport Country Playhouse, 25 Powers Court, off Route 1, Westport. www.westportplayhouse.org. Beginning with legendary broadcast journalist and co-editor of "60 Minutes" Lesley Stahl on Sept. 19, an exciting roster of seven speakers takes the stage at Fairfield University’s Regina A. Quick Center for the Arts for the 2012-2013 Arts & Minds signature lecture series. Wednesday, September 19, 2012, 8 p.m.
At the podium, Lesley Stahl discusses her professional and personal life as one of the first female television reporters. She was first hired at CBS News in 1972, the same day that affirmative action was passed, entering an industry that was male-dominated, but striving to make a name for herself. Lesley Stahl has been a 60 Minutes correspondent since March 1991. Her reporting of political and impactful stories has won countless Emmy awards throughout her career. Prior to joining 60 Minutes, Stahl served as CBS News White House correspondent during the Carter and Reagan presidencies and part of the term of George H. W. Bush. Her book Reporting Live (Simon & Schuster, 1999) looks at the subject of covering Washington for more than 20 years. Monday, October 1, 2012, 8 p.m. This special OVF lecture, the Seventh Annual Students Forum, pairs two high powered Washington insiders from opposite sides of the aisle. As only the second female press secretary in U.S. history and the first female Republican, Dana Perino was one of the most widely- respected members of President Bush’s senior staff. She is an expert in crafting and communicating key messages under stressful conditions and a keen analyst of the latest political news. Donna Brazile, political strategist and current Vice Chair of Voter Registration and Participation at the Democratic National Committee, is hard to ignore, given her penchant for candor and 20 years’ experience in the making of Democratic presidential candidates. Monday, November 12, 2012, 8 p.m.
Kati Marton has successfully combined a career as a reporter and writer with human rights advocacy. Contributing to major news organizations, she has covered everything from terrorist attacks in Northern Ireland to the peace efforts in the Middle East. Marton is actively involved in humanitarian causes and was chief of Outreach at the United Nations. In her latest book, Enemies of the People: My Family’s Journey to America, she reveals her eyewitness account of her parent’s arrests in Cold War Budapest. This is the Annual Jacoby-Lunin Humanitarian Lectureship. Co-sponsored by the Carl and Dorothy Bennett Center for Judaic Studies. Funded by the Frank Jacoby Foundation. Monday, January 28, 2013, 8 p.m. Known for her dry, irreverent wit, Fran Lebowitz delivers unapologetic opinions about modern life. A fixture in the New York magazine world since the early 1970s, Lebowitz was hired by Andy Warhol as a columnist for Interview and has been a contributor to Mademoiselle and Vanity Fair. Her bestselling books of essays, Metropolitan Life and Social Studies, have been collected in The Fran Lebowitz Reader, and she is the author of the children’s book Mr. Chas and Lisa Sue Meet the Pandas. Lebowitz was the subject of Martin Scorsese’s recent documentary film Public Speaking and is back at work on her long-awaited novel, Exterior Signs of Wealth. Monday, February 11, 2013, 8 p.m.
Born in New York City, Barry Lewis is an architectural historian and acclaimed speaker, teacher, and author. 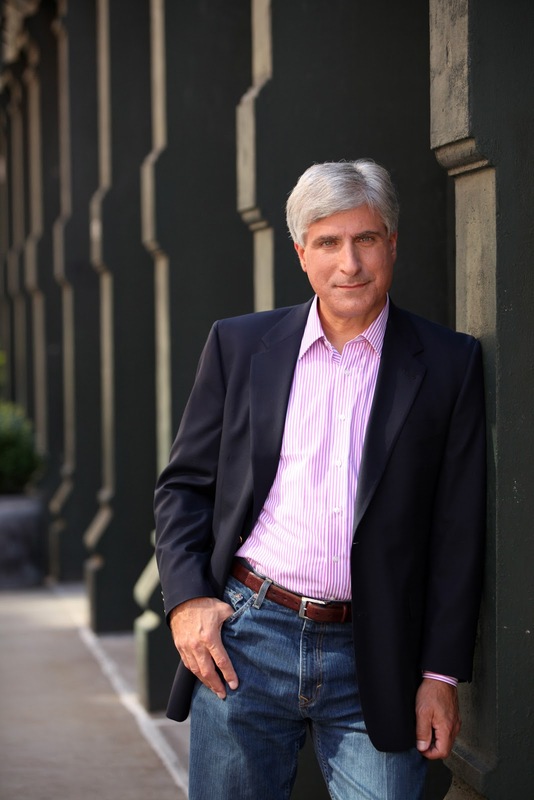 Among many projects, Lewis is known for his WNET Channel 13 series of video walks co-hosted with David Hartman, including 42nd Street, Broadway; Harlem; Brooklyn; Greenwich Village; and Central Park. Lewis is one of the most sought-after tour guides and will share with us a panoramic view of the city he loves and the people who make it work. Sunday, March 24, 2013, 3 p.m.
As the founding director of the Association for Research into Crimes Against Art, Charney’s work in the field of art crime has been praised in such international forums as The New York Times Magazine, TIME Magazine, BBC, National Public Radio, Vogue, and Vanity Fair, among many others. Charney is the author of numerous articles and the international bestselling novel The Art Thief (Atria, 2007) and Stealing of the Mystic Lamb (PublicAffairs, 2010). Recently a visiting lecturer at Yale University, Charney is now professor of art history at The American University of Rome. Monday, April 22, 2013, 8 p.m.
Dr. Tyson is an astrophysicist, science communicator, the Frederick P. Rose Director of the Hayden Planetarium at the Rose Center for Earth and Space, and a research associate in the Department of Astrophysics at the American Museum of Natural History. Since 2006, Dr. Tyson has hosted NOVA scienceNow on PBS and been a frequent guest on The Daily Show. Open VISION Forum single tickets for each lecture are $45. Subscriptions for all seven lectures are $266, a 15% discount. Tickets and subscriptions are available through the Quick Center Box Office: (203) 254-4010, or toll-free 1-877-ARTS-396. (1-877-278-7396). Tickets can also be purchased online at www.quickcenter.com. 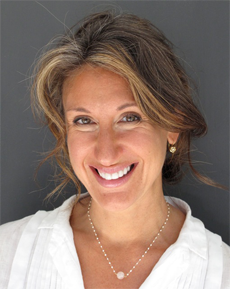 Westport’s Jane Green, nationally bestselling author, will speak at “Books Worth Talking About,” on Wednesday, August 29, 6:30 to 7:30 p.m., in the Lucille Lortel White Barn Center at Westport Country Playhouse. The literary salon will be followed by an 8 p.m. performance of the world premiere comedy, “Harbor,” written by two-time Tony Award nominee Chad Beguelin (“The Wedding Singer”) and directed by Mark Lamos, Westport Country Playhouse artistic director. “Books Worth Talking About,” a recently launched partnership between Westport Country Playhouse and Meryl L. Moss Media Relations, Inc., provides an opportunity to interact with prominent authors and explore ideas and themes to enrich the theater-going experience. Topics of the literary salons and theatrical productions are designed to complement each other. Green has written several bestselling novels including Promises to Keep, Dune Road, and Jemima J. Her most recent book is Another Piece of My Heart. A former feature writer for the Daily Mail in the UK, she now contributes to The Huffington Post and The Sunday Times. Green lives with her husband and six children in Westport, CT. The world premiere comedy “Harbor” opens with Ted and Kevin, who have been together for 10 years, in their picture perfect house in Sag Harbor. When Kevin's ne'er-do-well sister, whom he hasn’t seen in years, and her 15-year-old daughter arrive out of the blue, the pair's life changes and tensions quickly bubble to the surface. The bonds between kith and kin are tested in this alternately biting, touching and hilarious new comedy about the constantly shifting nature of the meaning of family. The comedy is recommended for ages 16 and up. The cast includes Tony Award nominee Bobby Steggert (Broadway’s “Ragtime”), Emmy Award nominee Paul Anthony Stewart (“Guiding Light”), Kate Nowlin and Alexis Molnar. The literary salon is open to anyone with a ticket for the Wednesday, August 29 performance. Subscribers to other performances may exchange their tickets into this evening by contacting the Playhouse box office at 203-227-4177. Green’s books will be available for purchase at the event from Playhouse community partners The Fairfield University Master of Fine Arts in Creative Writing and Fairfield University Bookstore. Sponsor of the Literary Salon is Catamount Wealth Management. Reservations for the “Books Worth Talking About” literary salon are necessary. RSVP at marketing@westportplayhouse.org or the Playhouse box office at (203)-227-4177. For more information or tickets to “Harbor,” playing August 28 – September 15, call the box office at (203) 227-4177, or toll-free at 1-888-927-7529, or visit Westport Country Playhouse, 25 Powers Court, off Route 1, Westport. Tickets are available online at www.westportplayhouse.org. The Kate has announced September events. For tickets and more information, visit www.TheKate.org or call 877-503-1286. The Katharine Hepburn Cultural Arts Center is located in Old Saybrook, CT.